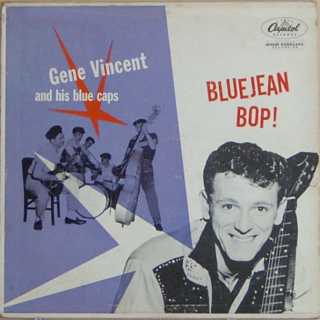 This week’s program is made of the usual blend of Rock ‘N’ Roll, Country and Boogie music, with Gene Vincent And His Blue Caps’ LP “Blue Jean Bop!”, first released in the U.S.A in 1956 on Capitol Records, being played in its entirety. L'album "fil rouge" sera cette semaine le 33 tours de Gene Vincent And His Blue Caps, "Blue Jean Bop! ", disque sorti aux U.S.A. en 1956 sur Capitol. 1. BIG JOE TURNER - "Honey Hush"
2. TINY BRADSHAW - "The Train Kept A-Rollin’"
3. Gene VINCENT And His BLUE CAPS - "Bluejean Bop"
4. BIG MAMA THORNTON - "Let Your Tears Fall, Babe"
5. Ruth BROWN – "Teardrops From My Eyes"
6. Gene VINCENT And His BLUE CAPS - "Jezebel"
7. The BIG THREE TRIO - "The Big Three Boogie"
8. Gene VINCENT And His BLUE CAPS - "Who Slapped John"
9. Johnnie RAY - "Such A Night"
10. Elvis PRESLEY - "Like A Baby"
11. Bill HALEY And His COMETS - "Razzle-Dazzle"
12. Clyde McPHATTER And The DRIFTERS - "Money Honey"
13. Gene VINCENT And His BLUE CAPS - "Ain’t She Sweet"
14. SNOOKUM RUSSELL ORCHESTRA - "Juke Box Boggie Boogie Chick"
16. Gene VINCENT And His BLUE CAPS - "I Flipped"
19. Gene VINCENT And His BLUE CAPS - "Waltz Of The Wind"
20. Freddie SLACK - "Rockin’ The Boogie"
21. Jerry Lee LEWIS - "Just Because"
22. The CLOVERS - "Down In The Alley"
23. Ray CHARLES And His Orchestra - "It Should Have Been Me"
24. Gene VINCENT And His BLUE CAPS - "Jump Back, Honey, Jump Back"
25. Georgia GIBBS – "Dance With Me Henry (The Wallflower)"
26. Bobby DARIN - "What’d I Say"
27. Gene VINCENT And His BLUE CAPS - "That Old Gang Of Mine"
28. Jerry Lee LEWIS - "Lincoln Limousine"
29. Lil ARMSTRONG - "Rock It"
30. Wynonie HARRIS - "All She Wants To Do Is Rock"
32. Gene VINCENT And His BLUE CAPS - "Jumps, Giggles And Shouts"
33. Doc POMUS - "Too Much Boogie"
34. LITTLE RICHARD - "Dew Drop Inn"
35. Gene VINCENT And His BLUE CAPS - "Up A Lazy River"
36. Bill HALEY And His COMETS – - "Birth Of The Boogie"
37. Boyd BENNETT And His ROCKETS – Vocal by BIG MOE - "Seventeen"
38. Gene VINCENT And His BLUE CAPS - "Bop Street"
39. Gene VINCENT And His BLUE CAPS - "Peg O’ My Heart"
40. BO DIDDLEY - "Before You Accuse Me"